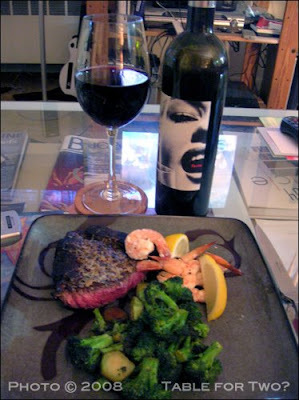 I think the classic surf and turf dinner consists of filet mignon and lobster tail – delicious, I’m sure, but a little rich for us right now. Besides, with my food allergies, its entirely possible that I can’t eat lobster at all. I don’t actually know, I’ve been too scared to find out. I know, I know, I’m a wuss. Shut up. Anyway, this is our significantly-cheaper version of the classic, because even if we can’t afford filet and lobster we just can’t resist the perfect pairing of tender, beefy steak with delicate, moist shellfish. And when you don’t even have to go out for dinner for a great steakhouse meal, well, why would you ever want to? That being said… well, honestly, this just didn’t come out that good. It sounded great in theory, and I think if we’d thought a little more about execution it probably would have been. 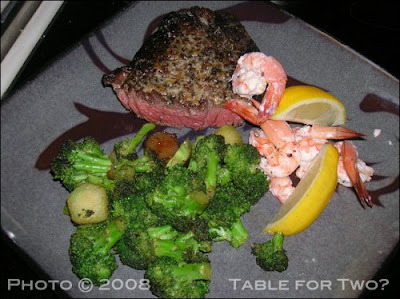 As it is, the steak was tasty but slightly overcooked and light on the seasonings, and the shrimp were WAY overcooked, so dry and rubbery I honestly couldn’t bring myself to finish them. I can’t even remember the last time we overcooked shrimp, let alone overcooked them THIS badly. How embarrassing. It certainly looks good, doesn’t it? Sigh. It wasn’t a total failure, because the steak itself WAS quite beefy and plenty juicy, and I think the seasoning would have been great had we ramped it up a notch. It was very simple – just some kosher salt and black pepper, plus a few grinds from my new favorite spice mill, and some finely-grated fiore de sardegna cheese that we toasted into a crust under the broiler right before serving. It needed more of both, I think, because the flavors were there but were a bit subtle for my tastes, and the cheese crust didn’t really adhere to the meat as well as I’d like, probably because it was too thin. I’m not really sure what happened with the shrimp – J cooked both the shrimp and the steak on the grill, and normally he’s flawless with that, but the shrimp were in a pouch rather than directly on the grill grates, so I think it may just have been an issue of visibility. They DID taste good, lightly seasoned with kosher salt, black pepper, and lemon, but I just couldn’t get around the texture. Not a big deal though, because we’ve turned out enough perfectly cooked shrimp that I’m willing to call this one a fluke, an error in judgement, and just pretend it never happened. Next time will be better. However, check out that broccoli up there. THAT was tasty. Broccoli is just about my favorite vegetable in the whole world (I was one of those weird kids who actually got excited when my mom made it with dinner) and I’ve been cooking it for as long as I’ve been cooking, basically, so I’ve pretty much got perfectly cooked just-tender broccoli down pat (although I do still screw it up sometimes). I switch up the flavors depending on the meal its accompanying, but my method is simply to melt equal parts butter and olive oil in a pan over low heat so that the fats in the butter don’t burn before it melts completely, then crank it up to medium-high and toss in a whole mess of fresh broccoli florets. (and the stems sliced-up, if I’m feeling frugal and don’t want to waste them. Last night was one of those nights.) Then I’ll add whatever seasonings I happen to be using – last night was garlic and onion powder, soy sauce, black pepper, and a few grinds of the same dry porcini used on the steak (and yes, I do occasionally use garlic and onion powder instead of fresh when I don’t feel like chasing bits of garlic and onion around my plate. Again, last night was one of those nights.) – and basically stir-fry the broccoli until its nice and green and slightly browned around the edges, and is tender but still just a bit crisp in the very middle of the stalks. Mushy broccoli is not something anyone likes. Or at least, I certainly hope not. This technique works just about every time, as long as I pay attention and don’t walk away for too long so that it burns, or add to much liquid for flavor so that it takes forever to boil off and gets mushy. Sometimes I switch up the soy for lemon juice, or use fresh garlic and onions, or use balsamic vinegar and honey, or a sweet chili sauce – no matter what, its always good. And honestly, I don’t care that the shrimpwere less-than-stellar, because I can just about always make do with a big ol’ bowl of broccoli and nothing else and be completely satisfied. The fact that this time, the broccoli came with a pretty decent steak, was just a bonus. A big bonus. If you ignore the blurriness of this photo, you’ll notice that we were drinking Bedell wine, yet again. This time it was the Taste Red, and it was every bit as good as I remembered and a really lovely pairing with the rich, savory, meaty steak. I do think we just might need to repeat this meal and get it right, so we can have an excuse to buy another bottle. Now, dinner may not have been a hit, but dessert… oh, dessert was a home run. And it was SO EASY. A couple of weeks ago I picked up some late season rhubarb at Chelsea Market, wanting to make a strawberry rhubarb pie for J. (Who has never even tasted it. *gasp! * *shock! * *dismay! * I know!) However, being the scatterbrain that I tend to be, I completely neglected to buy strawberries at the store, and lacking the transportation or the strength of will to go back out to the store at the time, I decided to make rhubarb preserves instead, figuring that just about anything I could think to make with rhubarb would work just as well with rhubarb preserves. Besides, the preserves themselves were shockingly delicious – they’re extremely simple, made with just about 5 cups of fresh diced rhubarb, 4 cups of sugar, and a bit of water to bring everything together, and although I will admit the preserves might have come out a bit too sweet, and I’ll knock the sugar back by half a cup next time, the finished product is shockingly complex on the tongue – sweet, floral, fresh, just barely tart and bitter beneath the sweetness. Delicious. Finally this weekend I had the presence of mind to pick up a punnet of strawberries, but I found that I was no longer in the mood to go to all the trouble of baking a pie. But I also found that I had about half a container of whipping cream in the fridge, leftover from a batch of vichyssoise last week, and some good aged balsamic vinegar in the cupboard. Bingo! Forgive the yellow-ness of my living room lighting – I promise that in actuality this was white and red and gorgeous. I made this in about 35 minutes total last night, with about half an hour of that time being completely inactive while the strawberries macerated. Yes, it really is that quick, and just about the easiest desert I think I’ve ever made. But you would never, ever know then when you taste it. This, my friends, is divine. Combine the strawberries, sugar, balsamic and black pepper in a bowl and stir to coat the berries and help the sugar begin to dissolve. Cover with plastic wrap and stash in your fridge for at least half an hour, or longer if you can manage it – the longer they sit, the better they’ll taste. Pour the cream into a cold metal bowl and whip the heck out of it, preferably with a hand mixer or a stand mixer if you have it, but go ahead and use a whisk if you have that much arm muscle. You want to whip until you see soft peaks, then add the sugar and continue to whip until stiff peaks form and the sugar dissolves into the cream. Just don’t over-beat, or you’ll end up with butter! 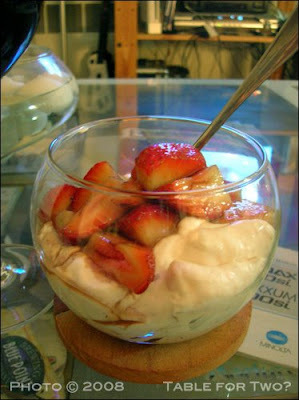 To serve, spoon some of the strawberries into the bottom of a dessert cup or bowl, then gently top with a generous amount of the rhubarb fool, and finally with another spoonful or two of the berries and a drizzle of the sweetened balsamic/strawberry syrup left behind in the bowl. Garnish with a bit of fresh mint if you have it, and serve to your grateful guests. Trust me, they’ll love you for this, no matter how mediocre dinner turns out. This entry was posted in Food, Drinks and Cooking, Table for Two? Archives and tagged cheese/dairy, desserts, dinners, fruit, seafood, steak, vegetables. Bookmark the permalink.